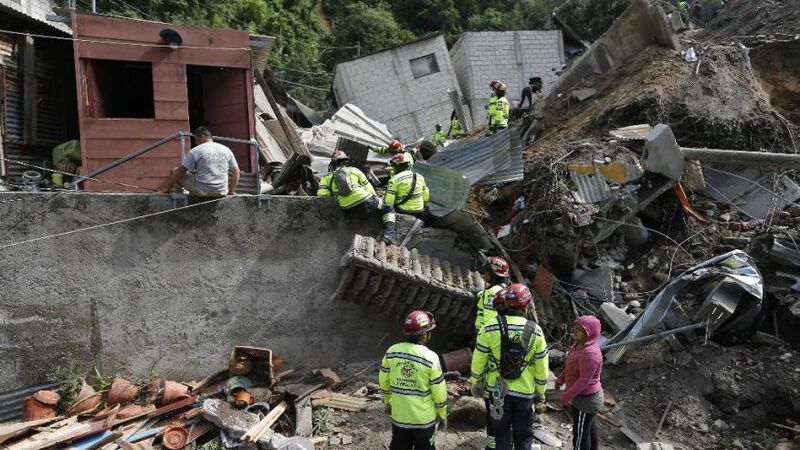 Hundreds of people are missing in Guatemala after a mudslide hit a village not far from the country’s capital. At least 26 bodies have so far been recovered from the village of El Cambray Dos, rescue services say. Heavy rains swept a torrent of boulders and mud onto houses on October 1, nine miles east of Guatemala City. Relatives have been receiving calls and texts from people trapped under the rubble, reporters at the scene say. Survivors have been taken to makeshift shelters. Rescuers temporarily called off the search on October 2 because of heavy rains, AP reports. Julio Sanchez, a spokesman for Guatemala’s volunteer firefighters, said 26 people had died, including a number of children, and another 36 people were taken to hospitals. One man was pulled alive from the rubble after more than 15 hours after the mudslide hit. Acting President Alejandro Maldonado has warned that as many as 600 people could still be missing. He said that number of people was believed to be asleep in their homes when the mudslide occurred, he added. El Cambray Dos is surrounded by steep hills that tower over the houses which are mostly set in the valley bottom. Alejandro Maldonado said in a radio interview that the forested hills had been weakening for some time and had collapsed largely because of recent heavy rain.